what is that pose in the intro? no real interview starts out like that. Read your history, no one was forced to leave anything, Arabs were told to evac by Jordan and Egypt or else the Israeli will kill them when their attack on Israel will start, and they were told they will be given their land back after the war is over and Israel is wiped clean. Most left, some stayed, they were not touched, Jordan and Egypt, among others, lost the war, and Israel is being blamed for not letting these who chose to run for no reason to hide behind countries who were attacking it, return. I see no moral or legal issue here. not one. Nothing much is new here. 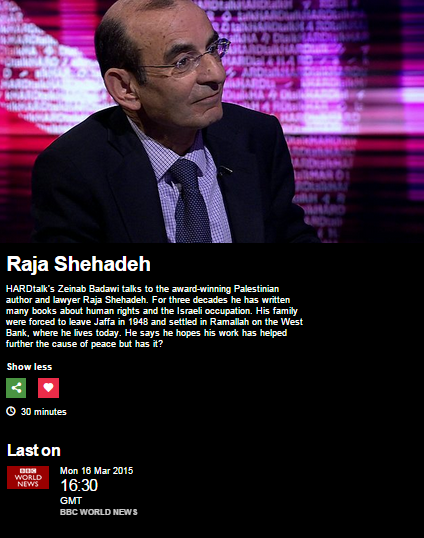 We are familiar with the BBC stance on Israel and I am happy to see someone is monitoring it. It would be good if someone would look at that lengthy interview with Israeli women soldiers vilifying themselves and their activity while in the Army. Often the Israeli left does as much if not more damage by filming these programs for dramatic effect, which the anti semitic crowed just loves to exploit. Why so many choose to take this stance against Israel should be subject for journalistic research, what is the antisemitic, anti Israel phenomenon, and how is this self-hating campaign is being used internationally in the media. I am surprised that more people are not writing or researching this since it is so pervasive and prevalent. BBC bias and distortion – what’s new?